That’s right! For a Total labor fee of $45, we will scan Hard Disk Drives for defects, clear the dust off of boards and fans, and clear heat sink and other vents of any foreign material. We will tighten fittings, mounts, and ensure all cables are properly and securely connected to their designated devices. We will then run a full diagnostic on the Operating System (OS), to ensure no issues are impeding the system’s performance, and we’ll even limit it from loading applications or programs that are either non-essential or no longer needed, including repairing any issues caused by Malware, faulty equipment, or Viruses. What’s more, if you bring us the needed part, we’ll even include that work as part of the original Labor fee. We’ll even provide an estimate before hand if you prefer us to pick them up for you. In our opinion, as long as the item being repaired is still in our possession, you can always plan on your total Labor cost remaining at forty-five dollars. * Parts will have to be paid for in advanced, but will carry any applicable Manufacturer’s warranty and we guarantee proper installation. We know that PC’s rarely stop working when it’s convenient to you. 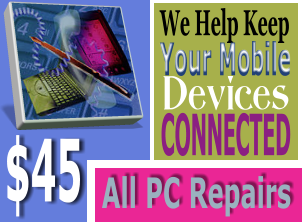 Therefore, you can easily schedule a time to bring in your PC, Laptop, or Device on just about any day of the year. Just be sure to download and fill out the Work Authorization Form, by clicking on the button below, print it, fill it out and present it to the Tech, before work can begin. Remember too, we can also come to your location, if that offers you more advantages. Learn more about our On-Site Services. To ensure we serve your needs in the best possible way, we simply ask that you use the Work Request Form, or call 610-996-4200 to give us more insight. Then, click on the Pay Now button (below) to validate and authorize the work. Using this method provides you a confirmation receipt and allows for any additional comments or instructions for each Work Request Form submission. If no parts are required (which, is typically the case), you can bring in your PC in the morning and we can have it ready for pick up that evening. And in some cases, you can drop it off on your way out to lunch, and we can have it ready for pick up on your way home that evening. Our subsidiary company, MainLineBiz.com, offers video services for local small businesses, as well as covering local events in and around the Main Line. If you have been featured in one of their videos and would like a copy of the footage, we can provide such via Dropbox. Simply select the length of the footage required, then click on the Pay Now button (below) to validate and authorize the work. Using this method provides you a confirmation receipt and allows for any additional comments or instructions.